This entry was posted in bikes, cargo bikes, seattle and tagged 1/1/09, cargobike rides, cargobikes, seattle. Bookmark the permalink. Update: Carl will be there with Swiss Army Bike and pot bellied stove! Huzzah for the stove and New Year’s warmth! Hi! 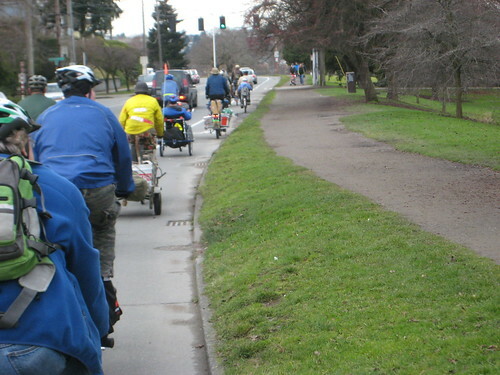 Do you know where everyone will be meeting at Greenlake? This might finally be my holiday to join you! I’m assuming maybe the community center/pool as a place to meet up?? Yep.. sorry about that Janet and Brian. Last year we met by the basketball courts/community center area. Hope to see you there. Excellent idea. I wonder if such a thing exists locally… time to do som Google time methinks. Sorry this took so long; pictures here: http://tinyurl.com/7hekxm Thanks to all!